The barbary serval is a subspecies of the serval found only in Algeria. 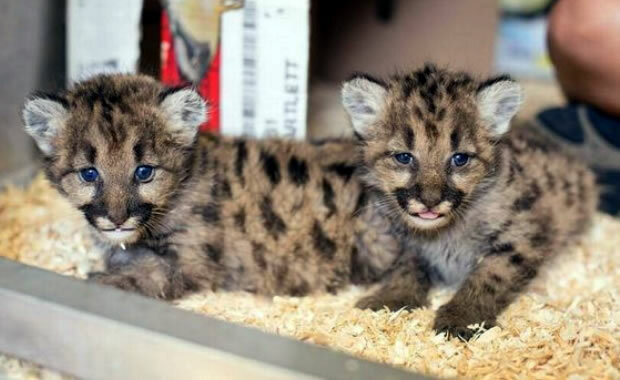 It is a medium-sized wild cat with a slender body, long legs, and a fairly short tail. The head is small and rounded, and the ears are set closely together. Fur pattern varies according to subspecies, but usually servals are pale yellow in color with black spots and variable black bands. Within the cat family, servals have the largest ears and longest legs relative to their body size. Some melanistic servals (all-black coloration similar to black panthers) have been observed. Servals reach about 2.79 feet (23.5 to 39 inches) in head and body length, and the tail 1.31 feet (9.5 to 18 inches) in length. They can weigh between 20 and 40 lbs. They are excellent jumpers and are able to leap up to 13 feet horizontally and 10 feet high, making them efficient hunters. They also have excellent senses of hearing and vision. They are excellent tree climbers, and take to the trees when predators are detected. The serval's preferred habitat is savannah and grassland where a water source is nearby. They are mainly active at dawn and dusk. During the day, they rest in abandoned aardvark burrow or under shady bushes. Servals are carnivores, feeding on birds, lizards, insects, frogs, rodents, and other small animals. Both male and female are territorial and mark their territory with their scent. They rarely come together accept for mating. Females give birth to up to five young after a gestation period of 67 to 77 days. The young depend on their mother for about six to eight months. Servals are found and are still common in West and East Africa, but the barbary serval subspecies, only found in Algeria, is endangered, if not already extinct. Threats to the serval species include hunting for its skin, persecution by farmers (since servals are known to hunt domestic livestock), and capture for the pet trade. Commercial trade of the serval is now regulated by international law. Glenn, C. R. 2006. 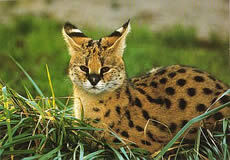 "Earth's Endangered Creatures - Barbary Serval Facts" (Online). Accessed 4/23/2019 at http://earthsendangered.com/profile.asp?sp=418&ID=1. Need more Barbary Serval facts?